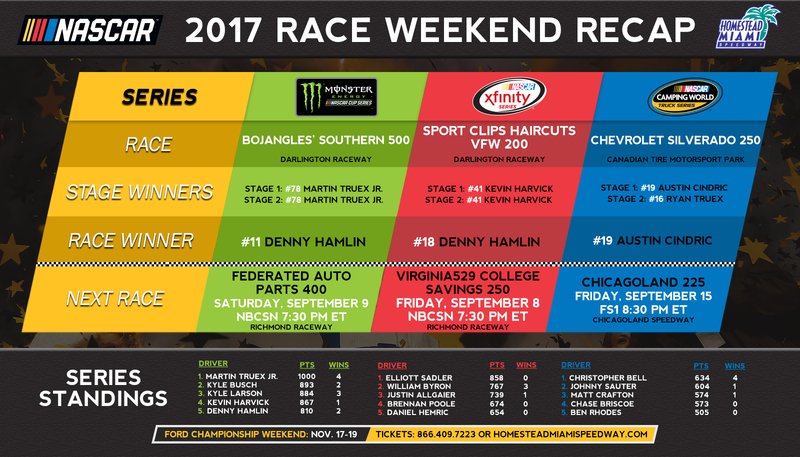 Darlington Raceway – Darlington, S.C.
· Denny Hamlin won the 68th annual Bojangles’ Southern 500 Monster Energy NASCAR Cup Series (MENCS) race at Darlington Raceway Sunday night. It is Hamlin’s 31st win in 423 career MENCS races and his second this year (at New Hampshire, 7/16). · It is Hamlin’s 14th top-10 finish and 10th top-5 in 25 races this year. It is his second victory (2010) and 10th top-10 finish in 12 races at Darlington. · Hamlin also won the XFINITY race at Darlington on Saturday, the second time he has completed a weekend sweep at Darlington (2010). Only two other drivers have done this – Dale Earnhardt Sr. (1987) and Mark Martin (1993). · Kyle Busch (2nd) posted his 15th top-10 finish in 25 MENCS races this year and his fifth in a row. · Kurt Busch (3rd) posted his 12th top-10 finish in 25 races this year. It was also his fourth top-5 showing and his second straight. · Erik Jones (5th) was the highest finishing rookie. · Martin Truex Jr. won both Stage 1 and Stage 2 of Sunday’s race, giving him a series-high 17 stage wins on the year. · Truex also clinched the 2017 Monster Energy NASCAR Cup Series regular season championship on Sunday. · Martin Truex Jr. (1,000) leads the 2017 point standings by 107 points over Kyle Busch (893). They are followed by Kyle Larson (884) and Kevin Harvick (867). · Denny Hamlin has captured a pair of victories (2009, 2013) in 12 starts at Homestead-Miami Speedway. In 2014 he was part of the Championship 4 in the Ford EcoBoost 400 where he finished eighth. 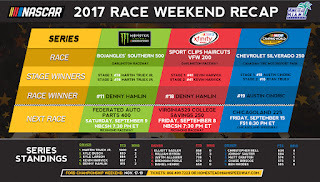 · Denny Hamlin won the 35th annual Sports Clips Haircuts VFW 200 at Darlington Raceway Saturday afternoon. It is his 17th victory in 159 career XFINITY Series starts, and his second win this year. · Joey Logano was second and Kevin Harvick finished third. · Rookie William Byron (5th) was the highest finishing XFINITY Series regular. · With victories to their credit this year, William Byron (3), Justin Allgaier (1), Ryan Reed (1) and Jeremy Clements (1) have clinched spots in the 12-driver playoff field in the 2017 NASCAR XFINITY Series Playoffs. Other drivers who have clinched playoff spots as a result of points are Elliott Sadler (858), Brennan Poole (674), Daniel Hemric (654) and Cole Custer (590). The Playoffs culminate with the Ford EcoBoost 300 XFINITY Series championship race at Homestead-Miami Speedway on Saturday, November 18. · Elliott Sadler (858) leads the XFINITY Series points standings by 91 points over rookie William Byron (767). They are followed by Justin Allgaier (739). · Rookie Austin Cindric won the 5th annual Chevrolet Silverado 250 NASCAR Camping World Truck Series race Sunday afternoon at Canadian Tire Motorsport Park in Bowmanville, Ontario. It marked his first victory in 21 career NCWTS starts. · This is Cindric’s ninth top-10 finish and fourth top-5 in 21 races this year. · Noah Gragson (2nd) accounted for his 10th top-10 finish and third top-5 showing in 15 NCWTS races this year. · Kaz Grala (3rd) posted his fifth top-10 finish and third top-5 showing in 15 races this year. · Christopher Bell (4 wins), John Hunter Nemechek (2 wins), rookies Kaz Grala (1 win) and Austin Cindric (1 win), Johnny Sauter (1 win) and Matt Crafton (1 win) all have qualified for the 8-driver field in the 2017 NASCAR Camping World Truck Series Playoffs. The Playoffs culminate with the Ford EcoBoost 200 Camping World Truck Series championship race at Homestead-Miami Speedway on Friday, November 17. · Christopher Bell (634) leads the points standings by 30 points over Johnny Sauter (604). Two-time series champion Matt Crafton has compiled 574, while rookie Chase Briscoe has collected 573 points.